I have a confession to make. Don't tell anybody.. I don't have any MAC lipstick in my beauty stash. Can you believe that? Oh hush. I told you.. don't tell! Haha. Kidding aside, I've been meaning to buy shades like ruby woo and lady danger long ago, but I would always think twice every time I pass by a MAC cosmetic store. I mean, it's not that I can't afford to buy them. I just don't feel like buying since I still have almost a dozen of lipsticks and lip gloss from brands like Avon, Maybelline, Etude House, and Elf. Half of them were given to me as a gift, the rest were from my own (panic) shopping. About the fake MAC lipstick, someone gave it to me as gift last Christmas. I don't hate the person who gave it me. I know she doesn't have any idea she was buying a fake product. Besides, gifts are gifts no matter how expensive or cheap or fake it is. Nice color huh. Oppss.. don't be deceived 'cause it's obviously fake. You can tell from the box alone. The MAC logo doesn't look like that. It is so wrong. The packaging is really bad. The bottom sticker of the lipstick says MAC 03? Any idea what shade is that really?! And.. lipstick lipstick lipstick lipstick? What the..! Here is another thing. The manufacturing details on the lipstick tube. I believe authentic MAC lipsticks don't have that. They're always plane black and gray though there are black/red, pink and white ones of flowers or characters like the Archie's Girls and Viva Glam collections. How to check if a lipstick has lead? Step 1: Get a clean white bond paper or any plain paper you can find. 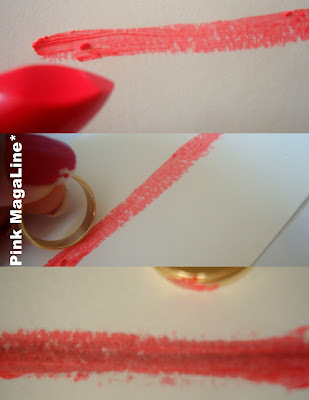 Step 2: Using the lipstick like a pen, draw a short line on the white paper. Step 3: Get a silver or gold jewelry. In my case, I used my wedding ring. Step 4: Rub the jewelry against the lipstick line. Step 5: Check the color of the lipstick. If color darkens then lipstick has traces of lead. Okay, now let me share this Q &A from US FDA from their updated article on lipstick and lead. No. We have assessed the potential for harm to consumers from use of lipstick containing lead at the levels found in both rounds of testing. Lipstick, as a product intended for topical use with limited absorption, is ingested only in very small quantities. We do not consider the lead levels we found in the lipsticks to be a safety concern. The lead levels we found are within the limits recommended by other public health authorities for lead in cosmetics, including lipstick. What are FDA's next steps for lead in lipstick? Although we do not believe that the lead content found in our recent lipstick analyses poses a safety concern, we are evaluating whether there may be a need to recommend an upper limit for lead in lipstick in order to further protect the health and welfare of consumers. To read the entire article, go to www.fda.gov. Lemme check my lippies for lead. gees! I can't wait to check my lipsticks when I get home! thanks for sharing this. That's a really nifty way of telling if a lipstick is fake! Thanks for sharing Mrs. K! Thank you for teaching us how to determine traces of lead in lippies. I'm a huge fan of MAC Cosmetics too. I think it is better to buy from a retail store and splurge even on a sum of bucks then risk your health buying somewhere cheaper but you don't know if is its fake or not, quality and health safety is all that matters. That's why I don't have MAC din. Ang daming OL shops selling these and ang hirap naman malaman which is fake or not lalo if diff picture nakalagay sa shop. Kaloka mga tao, pati ba naman lipstick. Thanks for that trick, that's really useful! thanks for sharing how to spot a fake mac. also thanks for letting us now how to tell if any cosmetic has lead!